"Come all of you, let us praise Him who was crucified for us"
The holy Book, the Triodion, underlines: "On the Holy and Great Friday, we perform the holy and salvationary Sufferings of our Lord, God and Saviour Jesus Christ. The spitting, the beatings, the slapping in the face, the insults, the mockery, the purple cloak, the cane, the sponge, the vinegar, the nails, the spear, and more so, the cross and the death, which He accepted voluntarily for our sake". Once again we find ourselves before the Passion of 'Him who is passionless in His divinity'. We do not remember nor simply 'commemorate'. However, the events unfold before us yet again, very much alive. The church where we are, is "The Place of the Skulls"! The cross we see, is genuine! The one attached to it is the King of glory! Jesus Christ died not according to will or fantasy, but in reality! And He dies now! "Today He who hung the earth upon the waters is hung upon the cross", we chant today! Here in front! Before us! Great is the mystery, my brethren. "The sky was amazed at this and the sun hid its rays. "My love has been crucified!" Gazing at the crucified One, dead, naked and unburied, I receive a sensation of the mystery, of the love of God. A love, of which no other is greater! "Greater love has no one than this, than to sacrifice one's life for his friends" (John 15:13). The Cross and Joseph's God-receiving Tomb are the wide-spreading preachers of the fact that the God-man "having loved His own who were in the world, He loved them to the end" (John 13:1). In saying "His own", does not only refer to the sacred twelve of the Holy Apostles or the wider circle of His Disciples and friends, but all mankind of all time! Even us unworthy Christians of today! He loves us to the end! That is with His perfect, complete and endless love. The love which is expressed as a voluntary suffering, as ingloriousness and dishonour, as grief and the furnace of the Cross, as death and descent to the store-house of Hades! Everyone of us can say for ourselves, together with the divine hymnographer: "You were crucified for me, so as to pour forth forgiveness for me, you were pierced in the sides to pour out to me fountains of life!" It has been sufficiently stressed of course from the beginning, that Jesus died for the world. However, that which with a loud voice must always be stressed, is that God's love is directed personally to every individual human. That is the Lord died: for me! for you! for him! for her! for us! That my soul, your soul, the other persons soul, is the beloved bride of Christ the Groom. "That the grace of His immaculate suffering is directed to us, individually named humans. That the record of our personal sins, was torn upon the cross. That He bought us from the curse of the Law, by His precious Blood. This underlying fact is exceptionally opportune today, more so than ever before when each individual feels alone, within the noisy population that surrounds him, betrayed and neglected by humans whose egocentrism has made them inhuman, poor and weak in front of the spectre of a future universal nuclear destruction during an era, where from the lack or scarcity of love, "the laughter has died and the children have grown old", as the poet would have said. At a time where sin is like a foul smelling suffocating cloud of death, incomparably worse than that of a sooty fog, polluting the atmosphere of life, poisoning us systematically, chasing away the joy from our hearts and filling each of us with the worst danger. At a time, which one could characterise as a spiritual winter in human history after Christ! A troparion of the Ainoi (Praises) of today's holy day states: "Every part of Your Holy flesh endured dishonour for us. The head endured the thorns, the face endured the spitting, the cheeks endured the slaps, the mouth endured the taste of gall mixed with vinegar, the ears the disrespectful blasphemies, the back endured the whipping, and the hand the reed, the areas of the whole body endured the cross, the hands and the feet the nails and the side endured the spear". This "dishonour", which every member of the holy flesh of the God-man endured, was also a death, prior to His three day life giving death. Parallel to this however, each one of these "dishonouring", each of His immaculate sufferings, each of His tortures, dealt death to each one of the contemptible passions of our fallen nature. The crown of thorns, the false royal purple and the mockering reed (supposedly a sceptre) killed our love of glory and vanity. The spitting and the slaps on the face, killed our egoism and arrogance. The vinegar and the gall, killed our soul-destroying gluttony. The impious blasphemies killed off our own blasphemies and slimy flattery. The nailing upon the cross, killed our attachment to the earthly pleasures. The thrusting of the lance, killed our cruelty and our lack of love for our brethren, and so on. Therefore, our contemptible passions, lack any power because of the holy and immaculate Passion of our Saviour. It remains for them to die by our actions as well. 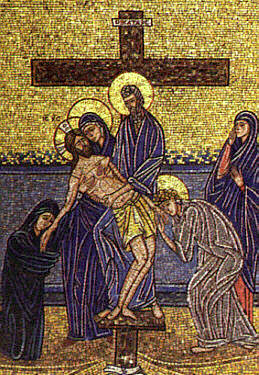 Our participation in the Passion of Christ, to which by we have been already invited to by the Church since Holy Monday, the following words: "Come therefore, and let us accompany Him, with purified minds and let us be crucified with Him and die through Him", refers exactly to this: To the death of our contemptible passions. That is, to cleanse ourselves within and to release ourselves from the passions which lurk in the depth of our life and drive us to soul destroying sin, such that we remain dead in relation to our unclean pleasures. Many are misled by thinking that participating in Christ's Passions, means to be nailed upon a cross on this day, or to whip their backs, as is customary among certain western Christians, or even to drink some vinegar, as was customary with us in the olden days. These expressions very likely to conceal egoism and vanity. Participation in Christ's Passion is the crucifixion of our old sinful ways. The crucifixion of which Saint Paul talks about: "I have been crucified with Christ, it is no longer I who live, but Christ lives in me" (Galatians 2:20). It is: the renunciation of our sinful and impure pleasures; the limiting of our needs; Spartan diets; fasting; watchfulness in prayer; genuine almsgiving; from the heart forgiveness of each other; patience during our afflictions and the difficult times in our lives; the non complaining during our sorrows; understanding our fellow humans, around us; the virginity of the unmarried and the common sense of the married; honesty in business exchanges; the voluntary and with love dispensation of existing rights; the returning of good in opposition to bad and love towards bad and wicked people; and so forth. Such a participation in the immaculate Passions of Christ guarantee participation in His life giving Resurrection. For one to take part in the glory of the Resurrection, they must endure the redeeming furnace of the Passion. To enjoy the divine lavish illumination of the Resurrection, one must live the darkness of the Cross ("Now it was about the sixth hour, and there was darkness over all the earth until the ninth hour, when the sun disappeared..." Luke 23:44). To taste the life granted to us, one must first experience the bitterness of death. And by the participation in the furnace of Suffering, the darkness of the Cross and the bitterness of death it is understood that it has no relationship to superficial and barren sentiments and "pious" emotions during that moment. It is, however, a matter of continual struggle, a hard spiritual struggle, which is carried out every hour and at every moment throughout our whole life, in regard to our relationship with our own self, with other people, with our environment and with God. It is obviously about a life long bloodless testimony. A testimony of love, which however, does not surpass the measure of our human capabilities. "Come all of you, let us praise Him who was crucified for us". Let us say together with our chanters, together with Joseph of Arimathea and Nicodemus: "I exalt your Passions, I praise in hymn your Burial, and together with your Resurrection, crying out; Lord, Glory to You". And I entreat that no one be entirely surprised on hearing talk already from this hour about the Resurrection. And this because our Orthodox Church never isolates the Cross from the Resurrection. It always mixes the bitterness of death with the sweetness of the Resurrection. Our Easter is one of Crucifixion and Resurrection. Likewise is Holy Friday. The sensation of the Orthodox is never only sorrow, nor only happiness, but is a blessed mixture of happiness and sorrow, known to the initiated as joyful-sadness. We are sorry, because our life is constantly a Golgotha. However, we are also joyful, as only a few metres further from Golgotha is the empty Tomb of Life. We are saddened, because our road is narrow and full of sorrow. We are happy however, because we have as Simon of Cyrene (carrier) of our Cross, the Lord Himself, but also because "the suffering of the present time are not worthy to be compared with the glory which shall be revealed in us" (Romans 8:18). "Come all of you, let us praise Him who was crucified for us "with intense sensation of joyful-sadness. For the "seen spectacle" of the suffering Jesus and the suffering death today and rising in glory tomorrow, as well as for our own death, mortification of sin, which will be extinguished by the forgiveness which will dawn from the Tomb. Glory to Your Condescesnsion our Philanthropic Lord"!